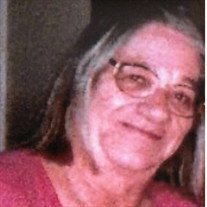 June Kathryn Walton, 67, of Cleveland, Texas passed away on Wednesday, September 12, 2018. She was born on Saturday, July 7, 1951 in Houston, Texas to Wilhelm "Bill" Schmidt and Lillian Beatrice "Wroten" Schmidt, both of whom have preceded her in death. June was also preceded in death by her daughter, Janet Jankowski. Left to cherish her memory is her loving husband Robert Walton; son, James Jankowski and wife Jamie; daughter, Anita Falls and husband Cody; two brothers, John Steven Schmidt and wife Judie, William Ronald Schmidt; five grandchildren, Nicholas Falls, Heather Falls, Kaylee Falls, Hannah Jankowski, Allison Jankowski; along with numerous other loving family and treasured friends. Graveside Services for June will be held at Chesterville Cemetery 5438 CR 262 East Bernard, TX 77435 on September 18, 2018 at 2PM. Brother Douglas Hollie officiating.